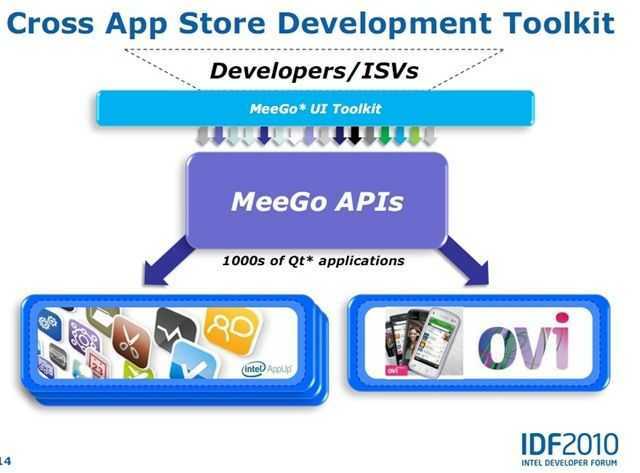 MeeGo at IDF. Netbook and Handheld Eye Candy, Chrome, Fennec and Lots of Developer Details. 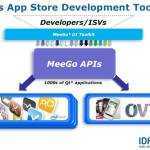 MeeGo gets an outing in China this week as Intel takes its developer-focused conference, IDF, to Beijing. As I write this, Intel’s Lynn Wang, Strategic Relationship Manager and Rao Yeleswarapu, a Product Marketing Manager have just finished their talk on MeeGo Technology and Benefits. Danny Zhang, Senior Engineering Manager and Horace Li a Software Engineer with Intel have also given a technical overview talk. 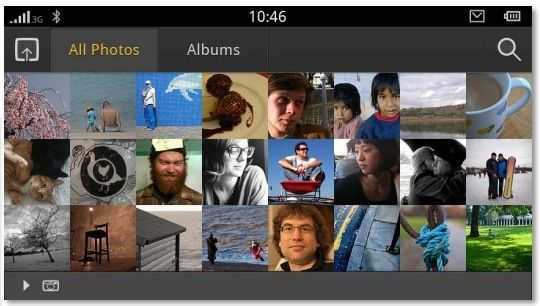 Update: MeeGo 1.0 for Netbooks is now available. As always, Intel publish the slides from the talks and they contain some great new information. 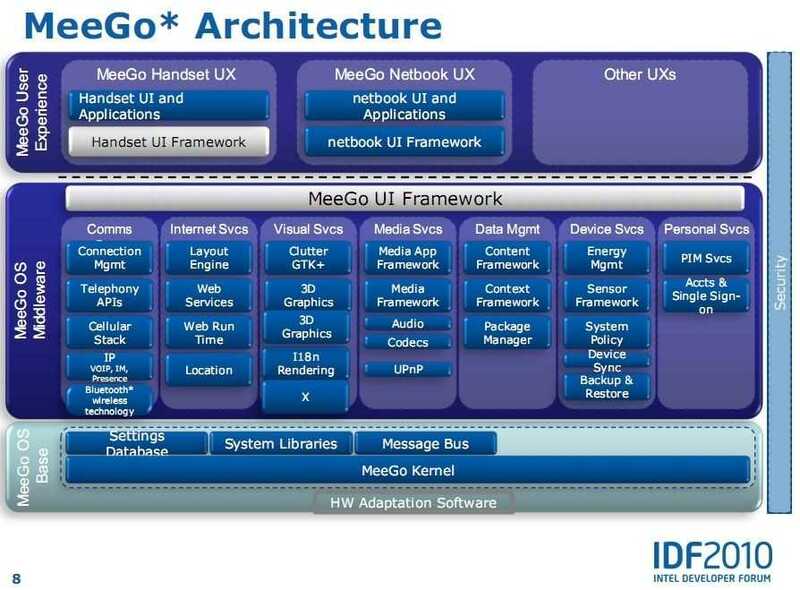 I’ve picked out a few interesting slides from the first presentation which also include the first images of MeeGo’s handheld reference UI for smartphones. You’ll also see that the social messaging app is to be redesigned (the application on Moblin 2.1 very very thin indeed) along with the camera application,email and calendar and date/time app. Best of all, the media application will get an overhaul. Again, the media app on Moblin was extremely basic. Remember that what drops out of MeeGo is not necessarily what you’ll see on netbooks. These code drops (starting with 1.0 in May) are for 3rd partys to take and build on so what you see in V1.0 is not what you’ll see in a final, retail build delivered on a netbook. 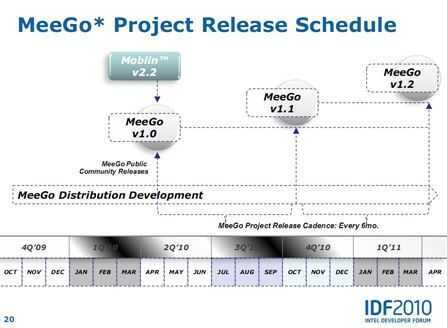 In other news, a number of companies have just re-affirmed their support for MeeGo as it transistions out of the Maemo brand. Note that Canonical isn’t in the list. That’s what happens when you move to an RPM-based distro I guess! 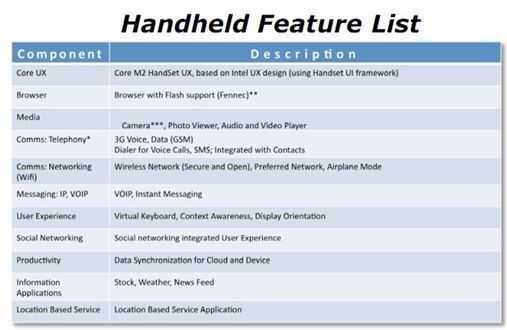 Note that the promised touch and gesture support is in there although I don’t see sensor support yet. That’s important for GPS. (It is, however, mentioned in other parts of the presentation.) Also missing is any mention of an application store. Intel’s AppUp is available for Moblin, OVI for Maemo so I wonder if this is simply left out of the core and left up to the OEMs. Remember that happened with Skype on Maemo 5, hopefully that particular relationship, optimisation and integration will spread over to netbooks. 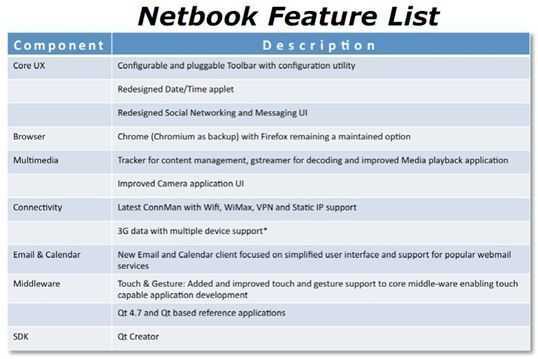 As for netbook eye candy, here’s a snip from the presentation. I don’t know if it’s the proposed 1.0 UI though. The center column has been dropped from the home zone and filled out with social network tiles. Having used these on Moblin, all I can say is â€“ inefficient. 13 status updates on a 1024×600 screen is not an efficient way to use the device for anyone remotely familiar with making friends on the Internet. 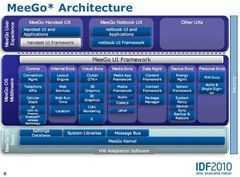 Let’s hope that the MeeGo UI teams offer an ‘advanced’ front end. Again, it’s not clear if this actually is the UI for release 1.0 though. Update: It is! It’s not clear whether this is Intel’s proposal here of if this is 100% agreed between Nokia and Intel but this is what Intel have to say about handhelds using Intel architecture. As you can see, Fennec, the mobile browser from Mozilla, has been chosen to present the Web. You’ll also get Flash support. Contacts and dialer functions will be integrated (as you’d expect) and there will be VOIP (it will be interesting to see if carriers want that ripped out) and instant messaging. 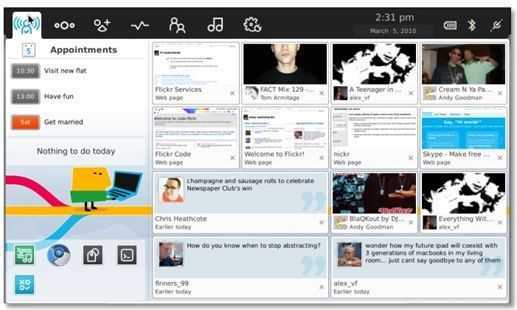 I’m happy to see that the social networking ‘integrated experience’ is mentioned because this is an excellent core feature on the Maemo 5-based Nokia N900. Data sync is also provided along with an LBS app indicating that at least GPS sensors will be supported. 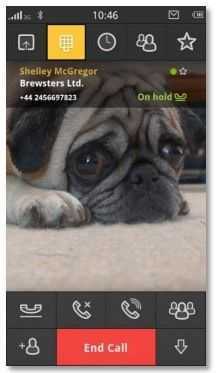 And now for the smartphone eye candy, including cute doggie! Portrait mode support. N900/Maemo fans rejoice! Note the interesting activity stream in the first picture. One would assume that emails, tweets and other network events can be included in that stream. This is typical understated European styling and I bet Nokia were heavily involved here. 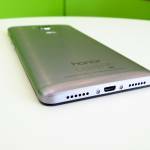 Personally I love the design but remember, once again this is just a reference design. It’s the sort of UI you’ll see if you take the 1.0 build and drop it on an Aava Moorestown reference design (which I’m trying hard to get hold of) and possibly, the N900. 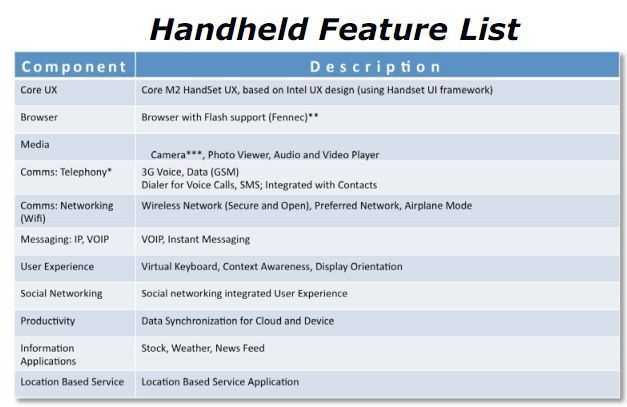 As I said before, I’m not sure if this is Intel’s proposal for the handheld UI or an agreed, across-the-board Nokia/Intel final reference design. We’ll see in May when V1.0 drops. I mentioned the roadmap on my MeeGo journal a few weeks ago and Intel have re-affirmed those in a nice easy-to-understand slide. 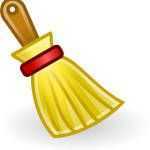 The key date for me is the v1.1 release in the latter part of October. That’s when the MeeGo Summit is likely to occur and it’s right in the Q4 timeframe for product availability. LG GW990, Nokia Nxxx and who knows what else we’ll see. Interestingly, the U.S-based Intel Developer Forum will be in the middle of Sept so it will be interesting to see if Intel and partners have products to announce. October will be a very exciting time and wherever that MeeGo Summit is, i’ll be there! ‘Cross App Store Developement’ is something special for devs to consider. The diagram doesn’t actually do the feature justice because it omits to mention the Intel app-store framework that can be used to make branded 3rd-party app stores. One API, many stores, many devices. In a separate presentation on the AppUp store I saw thisâ€¦ line. â€œWorld’s largest potential TAM (for a single API) â€œ When you think of the opportunity there, the mind boggles. Smartphones, Netbooks and the many many devices in-between including home, car and TV. all the above slides were taken from the publicly available PDF file SFTS009 available through in content catalogue. Stay tuned to that catalogue over the next 48 hours as more PDF’s feed in. Particularly interesting could be the Moorestown presentation. where can i get the PDF of the presentation? Check the link at the end of the article and search through for the session numbers i listed. Direct linking to the pdfs isn’t working. Ovi Store on not Nokia ONLY store. Nokia offers Ovi store to operators. The reason why Nokia model is different is that business model in chipset business and in mobile devices manufacturing is different. 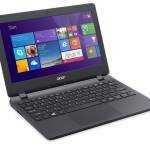 Intels customers are device manufacturers and Intel serves them. Nokia’s customers are operators. This is the big question mark. Intel’s and Nokia’s interest are so different. Intel’s customers are Nokia’s competitors. Also e.g. Intel just announced that they have ported Android to x86 chips. On the other hand Nokia uses mainly ARM chips and there have been rumors about Snapdragon etc. The list of confrontation is long. On this background I’m happy that Linux foundation is taking care of the project.